When is a book about baseball not a baseball book? When the book is Jonathan Schuppe's brilliantly realized A Chance to Win. What began as a feature article about a Little League team by a crime reporter turned into a tale of the long struggle to rebuild Newark, NJ. It's a story about the permanent underclass build by draconian drug laws, failed schools, and shattered families. It's a story about the shadow economy created by the shortfalls of the welfare state. Most of all, it's a story about how everyone involved in the generational tragedy that is Newark wants something better, but bereft of viable options, struggle to find a new path. Rodney Mason is an ex-con, a part-time drug dealer, a onetime standout baseball player rendered paraplegic by a drive-by shooting, and coach of the South Ward Little League's Elizabeth Avenue Eagles. 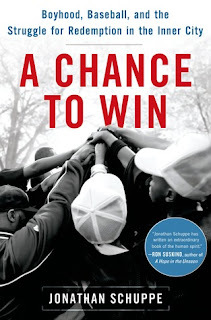 Schuppe masterfully draws together the Eagles' story, as a Little League team and after. As he establishes a personal connection with Mason, the kids and their families, I couldn't help feeling just as drawn into the experience as he surely was. The families' successes are encouraging, their errors are deflating, and their struggle to stay focused on the future in the midst of a world where life is cheap is inspiring. This is not the kind of feel-good book that will be made into a movie. The kids are poor. Only a couple have ever played baseball before; they come to their games without equipment and uniforms, and they come lugging all the baggage of poverty. But it's a book about the underdog's hope. It's a great read for spring. A Chance to Win doesn't come out for sale until May 7th, but you need to put your order in today. It's the best piece of non-fiction you'll read this season.